The sight of a black sand beach will really amaze you, especially if you're used to the typical sugary white sand found on most beaches. There are actually several of these interesting beaches on the island. Some are more easily accessible than others, but all are remarkable and offer a great contrast to the typical white and golden sand beaches that Hawaii is known for. In Hawaii, black sand forms in different ways. One of these is when a lava flow meets the ocean and the lava rock is pulverized into small bits eventually forming a black sand. The young geological age of the Big Island makes it the only place in the Hawaiian Islands where you'll see this kind of beach. 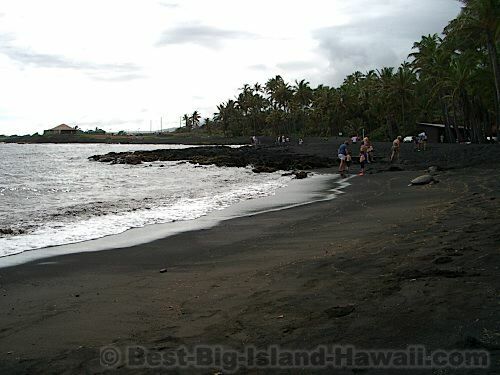 The easiest black sand beach to get to on the Big Island is Punalu'u Beach. Punalu'u is on the east side of the southern tip of the Big Island. It is easily accessible from Highway 11 between mile markers 55 and 56. While not usually as sunny as the west side of the the island, this part of the Big Island has it's own attractions. Behind Punalu'u Beach is a beautiful freshwater pool and the area is a fun place to explore. You can swim at Punalu'u safely, especially near the shore, but it's not known as a great swimming beach. 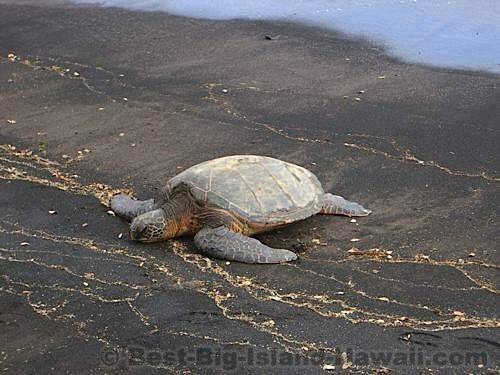 Punalu'u is also an excellent place to check out sea turtles. These sea turtles (or honu) are beautiful to observe, but be careful not to disturb, chase or try to play with them either in the water or on the beach. Sea turtles are protected animals and disturbing them is illegal and can carries a substantial fine. One more thing about Punalu'u...Please do not take any sand with you from this beach. Believe it or not, the sand here is finite and is not replenished by fish the way that white sand from coral is. Enjoy the black sand while you're here, but please leave it behind (except for what gets stuck in your feet and in your shorts, there's not much anyone can do about that). 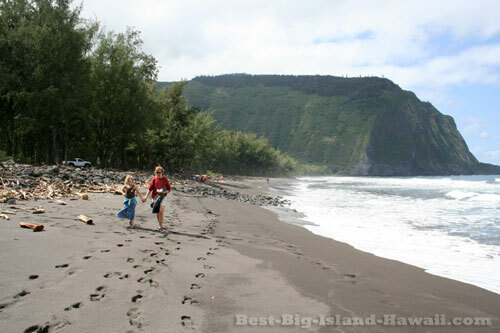 Another spot to check out a black sand beach is in Waipio Valley. In Waipio, the beach stretches across the front of the valley and is bisected by a freshwater river flowing through the valley and into the sea. One important thing to remember here is that this is not a good place for swimming. The currents can be very strong. When exploring Waipio, it's best to stay out of the water and enjoy this beach from the shore. These beaches are not your typical Hawaiian beach experience, but they are unique, memorable and well worth checking out while you're on the Big Island. These spots are great for wandering and exploring but not as great for swimming and sun bathing. If you've had a few lazy beach days in a row and you're up for something a little different, check out one of these Hawaiian wonders.